Looking for a trampoline with a little extra bounce? Well then the New AlleyOOP 14 Ft VariableBounce Trampoline might just be the perfect one for you. 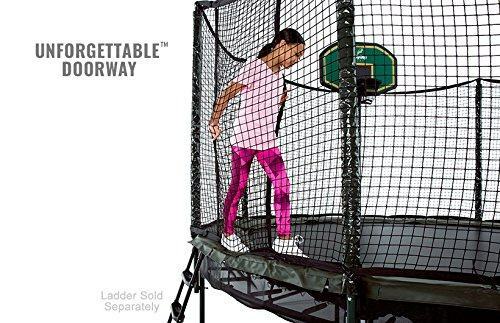 The AlleyOOP trampoline is large enough to accompany multiple jumpers, and has the build quality to do so as well, but not overly large that you need a massive yard for it. Also, they factored in visual appeal when designing this trampoline, so it is not an eye sore in your yard like some trampolines can be. The AlleyOOP VariableBounce Trampoline starts with a pre-galvanized steel frame. Being pre-galvanized offers protection from the weather. Galvanized steel will not rust like normal steel. The individual jumper weight recommendation is 250 pounds with multiple jumpers not to exceed 800 pounds. This amount is well above most of the competition weight range. One way that it accomplishes this task, outside of using pre-galvanized steel, is the legs are in more of a W shape. Angles are scientifically more stable and stronger, so this engineering future helps provide the trampoline with the strength it needs. The frame is also powder coated in deep forest green. This adds another layer of protection to prevent rusting and is what makes the trampoline really look good, and blend into your yard. What really sets the New AlleyOOP 14 ft VariableBounce Trampoline apart is the spring design. 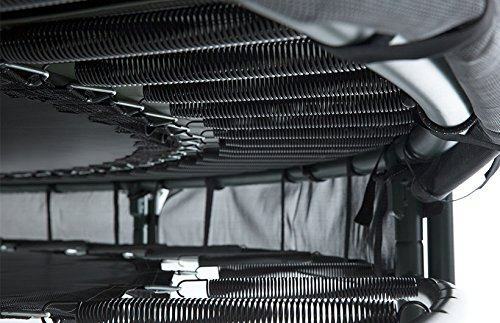 The trampoline comes with 96 Extra-Stretch High-Performance springs. By including so many springs it adds a lot of tension to the jumping mat providing an excellent bouncing surface. Also, the springs engage in a unique manner compared to other trampolines. The VariableBounce part of the name comes into the picture when the jumper lands on the trampoline. When the jumper lands the springs engage asynchronously. This means that when the jumper lands half the springs engage on impact, but then the other half of the springs engage a split second later. This leads to slowing the fall down slower, and makes the shook less hard on the body. Less of the landing force goes into the jumper’s body and instead the springs take that force. The fact that the springs take the force makes the return bounce even higher. The AlleyOOP VariableBounce Trampoline also comes with a high quality jumping mat that will last for years if taken care of correctly. It should be removed for winter months in area where it snows to prevent stretching, but other than that it is durable. 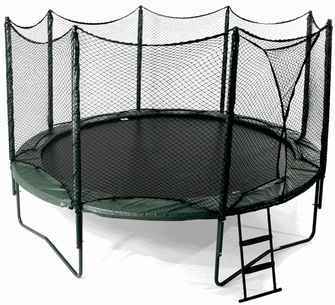 The AlleyOOP also comes with a durable enclosure that goes all the way around the trampoline. It is connected with padded poles that the net hooks onto.